Every week we pull together some great Canadian recipes from Canadian food bloggers around the web featuring one main ingredient or dish. This week, we want to share with you 18 ultra delicious vegan dinner entrees. One of the issues vegans have to deal with almost every time they go out to eat with non-vegans is the fact that there tend to be limited options when it comes to entrees. Unless they go to a vegan restaurant, most of the time they end up eating an array of side dishes. When eating at home, however, this shouldn't be the case. Plant based dinner entree options abound! From a classic French Ratatouille (remember? In the movie, the critic Ego eats it as a main dish), to aromatic curries and full on vegan burgers to an entire roasted cauliflower, there are many options to please your plant loving self with fabulous, fulfilling vegan entrees. So check out the gallery below and get ready for your next meat-free, animal byproduct-free, and ultra delicious vegan meal. This [Thai Seared Tofu in Kiwi, Ginger and Chili Marinade with Mango Kiwi Salsa](http://immigrantstable.com/2016/07/11/kiwi-dish/#.XDojiM_0m8o) is packed with refreshing flavours and will bring the colour and joy back into your weeknight dinners. From **At The Immigrant's Table**. Classic French recipes can be intimidating but for this [Ratatouille](https://www.baconismagic.ca/food/ratatouille-recipe/) all you need is a braising pot where you can layer the vegetables. They will cook beautifully! From **Bacon Is Magic**. This [Sticky Chinese Jackfruit](https://joandsue.blogspot.com/2018/06/sticky-chinese-jackfruit-vegangluten.html) is one of those dishes that you end up making over and over again. Not only is it tasty, quick and easy, and even fairly healthy... it's also vegan and gluten-free! From start to finish in about 10 minutes. Seriously. That's it. From **Jo and Sue**. So, you know when you come home from work and you want something yummy and healthy but you're tired and done and just want to chill? 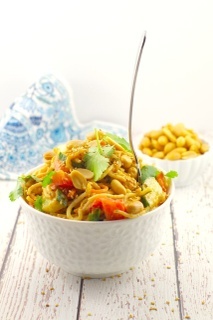 This [Chickpea Curry with Coconut and Cashews](http://www.picklesandpotstickers.com/blog/chickpea-curry-with-coconut-and-cashews) is the meal to make. It is a VERY easy and VERY versatile meal. From **Pickles and Potstickers**. This recipe for [Curried Chickpea and Cauliflower Wraps](https://domesticdreamboat.com/curried-chickpea-cauliflower-wraps/) is quick, easy, and healthy. Perfect for Meatless Monday! From **Domestic Dreamboat**. [Instant Pot Spicy Vegan Chili](https://www.crumbtopbaking.com/instant-pot-spicy-vegan-chili/) is hearty, flavourful and comes together in less than an hour. It’s loaded with vegetarian taco meat, as well as black beans and peppers, so you get a dose of fibre with a spicy kick! From **Crumb Top Baking**. Roasted seasonal vegetables are paired with a Garlic & Herb Macadamia Cheese for the ultimate [Sweet Potato Kale Flatbreads](https://www.cookinginmygenes.com/sweet-potato-kale-flatbreads/)! A simple recipe for dinner! From **Cooking In My Genes**. How about roasting a [Butternut Squash](https://www.slicedginger.com/home/baked-butternut-squash-with-pesto) and spreading a peppery pesto on top with a vibrant salad bursting with flavour?! Um…yes please! This healthy root vegetable just got a whole lot healthier! From **Sliced Ginger**. [Tajine Lentil Stew](https://www.dishnthekitchen.com/2019/01/11/tajine-lentil-stew-with-whole-roasted-cauliflower/) makes a delicious vegan main. Pair it with a smoky cauliflower and you've got yourself a delicious dinner! From **Dish 'n' the Kitchen**. These [Vegan Taco Rice Bowls](https://delightfuladventures.com/taco-rice-bowls/) are not only delicious, but they are also gluten-free and packed with fresh, tasty ingredients! A quick and easy weeknight dinner recipe! From **Delightful Adventures**. Click on the images below to be taken to more great Vegan Dinner Entree Recipes! So many great vegan dinner recipes in this round up! Thanks for sharing my chili recipe! !